Adya Pratap MUA, Delhi being a makeup artist is more than just a hobby. It makes him feel good to make people feel happier and confident. He loves the feeling he gets when he finishes the client's makeup and when they look in the mirror and say "I feel beautiful". Everyone needs a good touch-up once in a while, and Adya Pratap has a deep passion for this art. He specializes in all sorts of makeup like party, casual, engagement and bridal. He uses international products like MAC, Makeup Forever, Anastasia, Too Faced, Laura Mercier, Morphe and the list goes on. Contact Adya Pratap MUA, Delhi today and discuss your upcoming event makeup needs. 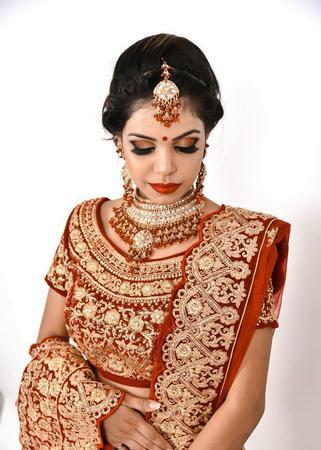 Adya Pratap MUA is a Bridal Makeup Artist based out of Sector 137 Noida, Delhi . Adya Pratap MUA's telephone number is 76-66-77-88-99, Adya Pratap MUA website address is https://www.naishasalon.com/, Facebook page is Adya Pratap MUA and address is Naisha Unisex Salon 3,Chauhan Market, Sector 141, Noida. In terms of pricing Adya Pratap MUA offers various packages starting at Rs 15000/-. There are 0 albums here at Weddingz -- suggest you have a look. Call weddingz.in to book Adya Pratap MUA at guaranteed prices and with peace of mind.